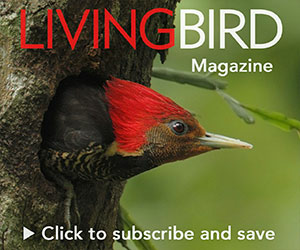 From the Autumn 2015 issue of Living Bird magazine. Clark's Nutcracker by Luis Villablanca. Taza Schaming heard the bird of her obsession long before she actually saw it. A rattle-squawk reverberated from somewhere within the Douglas-firs and limber pines. A swooping whoosh of wingbeats blew through the treetops. Then the Clark’s Nutcracker arrived on a bare branch. Bigger than a jay yet smaller than a crow, he wiped his miniature black lance of a bill back and forth against the branch like he had an itch. For weeks, the bundle of beef fat had been strung up 12 feet high. Schaming does this to habituate nutcrackers to feeding at a spot. But now the fat is down, and she’s hoping her quarry doesn’t notice the metal frame of a bownet trap camouflaged with leaf litter and forest duff. Schaming knows beef fat works best for luring nutcrackers. She’s been studying this bird—it’s been her life—since 2009 for her dissertation as a Ph.D. student at the Cornell Lab of Ornithology. She’s tried peanuts, playback calls, even a dead mouse tugged by a piece of fishing line. Trial and error brought her to a fresh pile of beef trimmings from a butcher in Jackson Hole. Her doctoral work here in Wyoming’s Bridger–Teton National Forest—just east of Grand Teton National Park and smack in the middle of the Greater Yellowstone Ecosystem—has included 76 radio-tagged nutcrackers. It’s the longest study ever conducted with individual Clark’s Nutcrackers, a seven-years-and-running project that has sent Schaming deep into the backcountry for intensive research on their foraging behavior and habitat use. Click above to watch as Schaming sets up to trap and band a Clark’s Nutcracker. Watch the full video about Schaming’s research here. The nutcracker swooped down to a lower branch, now tantalizingly perched just above the bait pile. Then he cocked his head to the side, reasoning and thought bubbling behind his polished obsidian pebble eyes. When the breeze blew just right, the curtain of fir needles behind the bird opened up to reveal a glimpse of the Grand Teton, a hulking mass of snow and rock with a band of evergreens across its midsection. The trees at the highest elevations are whitebark pines. Schaming’s research could be boiled down to the nutcracker in front of her, the whitebark pines in the distance, and the tight tie that binds them. “Clark’s Nutcracker is a keystone species, whitebark pine is a keystone species, and they’re both in a key mutualism in this ecosystem,” she says. Keystone species are plants or animals that are so critical to an ecosystem that the landscape would dramatically change without them. In the Greater Yellowstone Ecosystem, nutcrackers rely on whitebark pines as a crucial food source, the pines rely on nutcrackers to disperse and plant their seeds, and more than 100 other species of plants and animals benefit from that mutualism between tree and bird. But the web is at risk of unraveling. Whitebark pines have suffered massive mortalities from the deadly convergence of blister rust disease and mountain pine beetle outbreaks. Nutcracker populations have declined across half their range since 2003, according to Breeding Bird Survey data. The ripple effects extend throughout the ecosystem, from disappearing forests on mountain heights to the loss of a major food resource for grizzly bears. Today, Schaming is back on one of her study sites with a new technology, solar-powered satellite tags, to open up a new chapter of her research. She’s searching for ways to keep the nutcracker– whitebark mutualism intact. But first, she’s got to trap a bird. After much consternation, this noncompliant nutcracker flew away. “He’ll be back,” Schaming said confidently. The whitebark pine and the Clark’s Nutcracker are evolutionary soul mates that help hold an ecosystem together. At high elevations in the Greater Yellowstone ecosystem, whitebark pines depend entirely on nutcrackers to disperse their seeds. The pine nuts contain more calories than butter and provide food for more than 100 species, including (counterclockwise from bottom left) red squirrel, chipmunk, Cassin’s Finch, grizzly bear, Mountain Chickadee, and Hairy Woodpecker. Whitebark pines are also pioneers in mountain clearings and act as nurse trees (pictured center left) for spruces and firs to grow up. Illustration by Misaki Ouchida, Bartels Science Illustration Intern. Two hours later, the nutcracker returned for the fourth time, but he was still wary. Schaming had been munching trail mix and waiting for the morning sun to get up over the spindle tops of fir trees and shed a little warmth. It was October in the Tetons, a time when frost recedes from daylight and nutcrackers are busy finding and caching food for winter. Schaming puts colored leg bands on the birds she catches for easy identification. Photo courtesy of Taza Schaming. When a Gray Jay snatched a beef scrap from the pile and made off unmolested, the nutcracker was finally convinced. He landed a few feet away and kangaroo-hopped over on top of the pile. Schaming yanked the trigger string and thwump, he was caught. Finding out where nutcrackers go in the event of a food collapse could be a key to managing entire landscapes to give nutcrackers what they need. And foresters are very interested in providing for nutcrackers, because they act as an unpaid crew of avian tree planters on a scale that far exceeds anything the U.S. Forest Service could afford. Click above to learn how Schaming’s work on nutcrackers is helping us understand their important connection with whitebark pine. Watch the full video about Schaming’s research here. Scientists say that the whitebark pine is an obligate mutualist of the Clark’s Nutcracker, the tree totally reliant on the bird for seed dispersal. Whitebark pine cones don’t open on their own, and the seeds inside have no wings for floating on the wind. Instead, the tree puts all its energy into producing a large, fatty seed with high nutrition in the hopes that nutcrackers will come for a feast. A nutcracker can hold up to 150 of these seeds in its sublingual pouch (under its tongue). Nutcrackers plant the seeds at the ideal germination depth of about an inch during caching. Each nutcracker caches up to 100,000 seeds in a single year. But they don’t retrieve all of them—the untapped caches grow up into new whitebark pines. Tomback was the first to document the mutualism between nutcrackers and whitebark pines in a 1977 Living Bird article. Schaming has carried Tomback’s findings forward and expanded on them through more than 1,000 days in the field. On good days, she commutes past herds of grazing bison to spend a temperate summer’s day in the mountains. But the work can be grueling, sometimes bushwhacking 20 miles just to locate one of her radiotagged study birds. Pepper-spray is a must in the warmer months, as she works in grizzly country and keeps vigil for long hours over a pile of beef fat. (Thankfully, she hasn’t had a bear encounter yet.) Winter work means Telemark skiing through deep snow at minus-20 degrees Fahrenheit. Schaming’s payoff has been lots of quality time spent with nutcrackers, and a slew of field observations about their caching habits. For example, she’s documented that nutcrackers cache whitebark pine seeds in a variety of locations—from right below the very whitebark pine tree where they harvested seeds to several miles away back in the breeding territory where they intend to nest. Some birds contribute at communal caching sites where hundreds of nutcrackers put up a massive larder, whereas others keep private stashes. Land managers desperately need insights into the relationship between whitebarks and nutcrackers, because the tree is experiencing a major die-off across its range, and the bird is the best hope that whitebark pine stands will still be around at the end of this century. The twin scourges of blister rust and mountain pine beetles are devastating whitebark pines. The reddish needles of dying trees now cover vast swaths even in wilderness areas. Aerial photo of Yellowstone National Park by Jane Pargiter, EcoFlight. “Looking around here, I’d say 98 percent of the large trees are dead,” Schaming said. She stood atop Angle Mountain, elevation 10,079 feet. She was on a nutcracker survey, and getting up here was hard work, huffing uphill for more than an hour. At this altitude there’s usually a whitebark-pine-cone bonanza, which can equal abundant nutcrackers. There were no birds to be counted on this day, though. The devastation was evident. Click above to see Schaming explain how mountain pine beetles kill whitebark pines. Watch the full video about Schaming’s research here. A few sickly trees had open cankerous sores on their pale bark that were weeping sap, the victims of blister rust. And then there were the gray ghosts, whitebark pine skeletons with J-shaped scrawls etched in the bare wood. Each “J” marked where a mountain pine beetle female had excavated egg chambers. When the larvae in all these Js hatched, they ate the phloem and disrupted the flow of nutrients from needles to roots, thus starving the tree to death. The distant view was an Ansel Adams dreamscape—countless snow-capped peaks amid endless rough and rugged terrain. To the north lay the Absaroka Mountains and one of the most remote federal wilderness areas in the Lower 48; to the south Togwotee Pass cut an indent before the Tetons. But Schaming knew that the scourge up here on this mountain is creeping across the land as far as her eyes could see. As of 2009, 46 percent of the whitebark stands surveyed in the Greater Yellowstone Ecosystem were classified as “high mortality”; it’s surely well over half by now. “This is one of the most beloved and pristine areas in America,” she said. “It’s really disturbing to climb up mountain peaks and see swaths of dead trees, and to know it’s all human caused.” Blister rust is a human-introduced tree disease in North America; climate change has enabled unprecedented beetle outbreaks. In some years, the temperatures stay warm enough for two hatches of pine beetles in a single year. The die-off could have profound ecological consequences. Whitebark pines are the foundational trees of many subalpine and treeline forests in the West. They’re the first trees to regenerate after disturbance. (Tomback, the forest ecologist, saw nutcrackers caching whitebark seeds in the blackened earth after the 1988 Yellowstone fires.) As new whitebark pines sprout up, they provide shade and windbreak for other tree seedlings, such as Engelmann spruce and subalpine fir. Tomback says that as the pines and spruces and firs grow up, they cast a shade that holds onto the snowpack through the spring, preventing rapid melting and releasing the meltwater slowly through the summer. Besides nutcrackers, more than 100 other animal species feed on the highly nutritious whitebark pine seeds, which have a perounce calorie count about equal to butter. Other whitebark-seedeating birds include Hairy Woodpecker, Cassin’s Finch, Mountain Chickadee, and Pine Grosbeak. Among mammals, grizzly bears rely on whitebark pine seeds as an important food resource. USGS biologist David Mattson has conducted research that shows mortality rates for adolescent and adult bears go up when their whitebark pine seed consumption goes down. White pine blister rust is one of the two main factors killing whitebark pines. This tree shows the typical symptoms: huge open canker sores in the bark, with sap weeping down the trunk. It's caused by a non-native fungus first introduced to North America from Asia at the turn of the 20th century, it has spread to 38 states, causing extensive damage to several species of pines. The J-shaped scrawls etched into the wood of this dead whitebark pine are the work of a female mountain pine beetle, the other main cause of the die-off. She excavated an egg chamber in the then-living tree; when the larvae hatched, they ate the tree's phloem, disrupting the vital flow of nutrients between the roots and the needles, ultimately starving the tree to death. As for nutcrackers, it appears that the whitebark cone crop could be the deciding factor in whether or not nutcrackers breed in a given year. In two of Schaming’s first five years of field research (2008 and 2010), the whitebark cone crop failed, and she recorded no breeding activity among nutcrackers whatsoever the following spring—no nesting, no trapped adults with brood patches (bare spots on their belly plumage used to incubate eggs against warm skin), and no juvenile nutcrackers spotted at all. Schaming posits two possibilities: either nutcrackers were in such poor body condition from a lack of nutrition that they couldn’t breed, or they chose to skip the year because environmental conditions foretold lean times ahead. Do birds store food for the winter? Whitebark pines have no such coping strategies. When a local nutcracker population declines (either due to failed breeding or because the nutcrackers abandon an area to look elsewhere for food), the tree loses its evolutionary soul mate—its only agent of seed dispersal. In this scenario, whitebark pines are faced with a genetic bottleneck that eventually leads to their functional extinction in an ecosystem. That’s already happened in Glacier National Park, where blister rust swept through decades ago. People in Glacier are seeing fewer nutcrackers today than they did 20 years ago, and healthy whitebark stands are virtually nonexistent. In recognition of the whitebark pine’s ecological importance and dreadful outlook, Canada has listed the tree as an endangered species, and the United States has listed it as warranted for Endangered Species Act protection. U.S. Forest Service ecologist Robert Keane of the Rocky Mountain Research Station is a proponent of active and immediate intervention to save the tree. Keane estimates that whitebark pine forests could be functionally extinct within 100 years. “Without restoration, the whitebark pine forest is lost,” he says. Restoration means active management and silviculture, such as thinning to create space for whitebark seedlings and planting the seeds of pines with blister rust-resistant genes. But that action is expensive, and the USFS budget for whitebark restoration has been shrinking year after year. Meanwhile, as long as nutcrackers persist, they act as agents of tree propagation that work for free. Tomback has estimated the economic value of nutcrackers at upwards of $2,500 per hectare (the equivalent cost of USFS seeding). And nutcrackers can go where people can’t, planting trees in federal wilderness areas where the regulations prohibit human intervention. Keane’s models show that nutcrackers could play a role in a whitebark renaissance. Should the pines be able to survive blister rust and beetles, a future of more frequent wildfires could offer plenty of opportunities for nutcrackers to swoop in and plant seeds in burned soil. Keane says it may actually be possible for whitebark pines to reclaim their old range and expand into new ranges in a warmer climate. But that only happens if nutcrackers are still around. Researcher Taza Schaming attaches a tiny backpack containing a transmitter onto a Clark's Nutcracker. Schaming measures and weighs the nutcrackers, and takes tiny blood samples for analysis. A few of Schaming's field tools used to measure, band, and examine the birds. A tiny pinkie-fingernail-sized solar panel on each transmitter reduces battery weight and makes the pack light enough for a nutcracker to carry. Each satellite-tag backpack is hand sewn by Schaming with dental floss and teflon ribbon. The teflon breathes for the bird’s comfort; the dental floss stitching is tougher than thread. After securing the satellite backpack, Schaming prepares to release this Clark's Nutcracker back into Bridger-Teton National Forest. Schaming releases a bird with $3,500 of high-tech equipment in its backpack. The data it sends will help determine whether nutcrackers can track whitebark pine cone resources across a landscape. Down among the Douglas-firs at the bottom of Togwotee Pass, Schaming waited again for a nutcracker to visit her pile of beef fat. This time, a nutcracker was on the pile within 10 minutes. A minute later, Schaming retrieved the bird from the bownet and held him firmly. No leg bands on this bird; he was a newbie. Click above to watch as Schaming puts a GPS transmitter onto a bird. Watch the full video on Schaming’s research here. With the bird in one hand, Schaming opened up a small, foam-padded suitcase and took out what looked like a microchip dangling from a pair of brown straps. It was a satellite-tag backpack, handsewn by Schaming with dental floss and teflon ribbon (the teflon breathes for the bird’s comfort; the dental floss stitching is tougher than thread). She slipped the straps over the nutcracker’s wings, cinched them snug, checked to be sure the bird’s wings weren’t obstructed, and then gently tossed him aloft. His wings caught air immediately, and he flapped up to the top of a nearby fir tree. Schaming was beaming: “You’re going to provide me so much data!” She looked like a proud mother sending her kindergartner off on his first day of school, except that this kid toddled off with $3,500 of high-tech equipment in his backpack—a tiny transmitter that pings a data point every time satellites in the celestial heavens pass overhead, plus a fingernail-sized solar panel that reduces the battery weight, making the pack light enough to be carried by a bird. 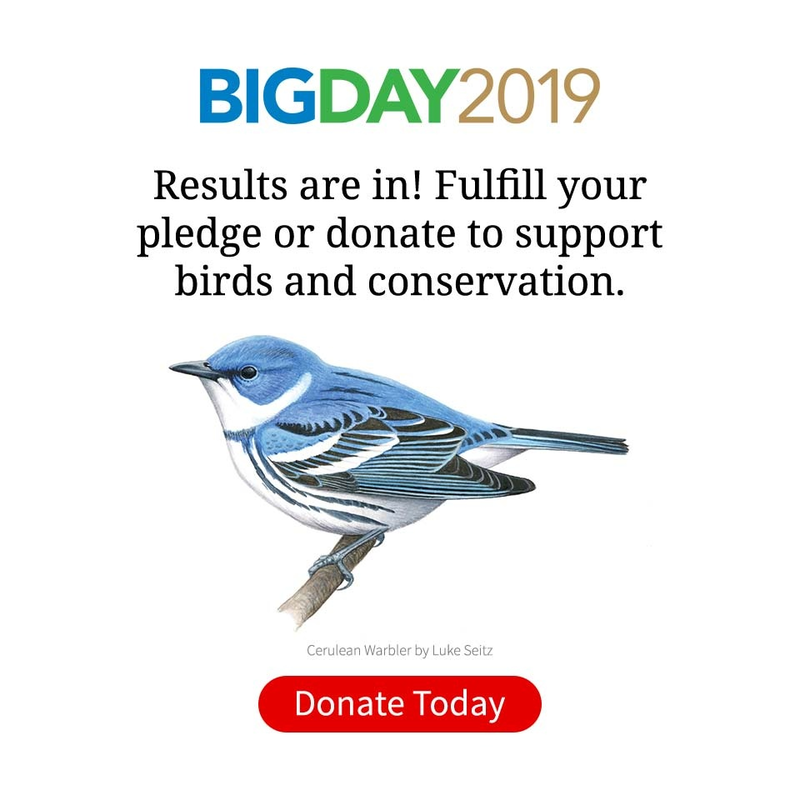 Schaming had high hopes that this bird and the six others she was planning to outfit with satellite tags would answer her questions, such as whether nutcrackers can track whitebark pine cone resources across long distances in a landscape. ese findings have real-world forestry applications. For example, if foresters plant a whitebark pine stand somewhere, can they rely on traveling nutcrackers to find the new trees and propagate their seeds? She’s also hoping to uncover more evidence of the importance of Douglas-firs to nutcrackers. For decades, scientists have focused solely on whitebarks or other large-seeded pines as the habitat component that nutcrackers need. But in the years of the whitebark cone crop failures, Schaming observed nutcrackers feasting on Douglas-fir seeds—not a good nutritional substitute (it takes 20 Douglas-fir seeds to equal the calorie content of one whitebark pine seed), but perhaps good enough to get by in lean years. In her radio-tracking, Schaming noted that nutcrackers tended to prefer Douglas-fir habitat more often for their breeding season range than any other trees, including whitebark pine. She’s submitting her research to foresters in the Bridger- Teton National Forest and nearby national parks to use in their management plans and advising them to focus their whitebark pine restoration management efforts in close proximity to Douglas- firs. It seems that both tree species are necessary to create the ideal habitat mix for nutcrackers. Taza Schaming’s research in Wyoming’s Bridger–Teton National Forest is the longest study ever conducted with individual Clark’s Nutcrackers, requiring many hours deep in the backcountry for intensive research on their foraging behavior and habitat use. <em>Photo courtesy of Taza Schaming</em>. At the Café Boheme near downtown Jackson Hole, Schaming ordered a cup of hot tea, sat down at a table, and popped open her laptop. She was a bit grubby after five days in the field with no shower. And the clientele looked upscale—a couple in a nearby booth were clad in Patagonia-chic. But she wasn’t there for the social scene, just the wifi. Watch Schaming’s reaction as her first results from the satellite transmitters come in. Watch the full video about Schaming’s research here. She took a big breath as her computer booted up. This was the moment she’d find out if her big gamble, more than $20,000 in funds raised for satellite tracking, would work. She knew that failure often comes first. She learned that when the nutcrackers bounced out of the mist nets when she first tried trapping them back in 2009. Other scientists have been forced to abandon nutcracker study projects because they were unable to trap this bird. Schaming has trapped 185 nutcrackers, and she was hoping number 186 was about to pay off. Finally, the spinning beach ball on her computer gave way and a topo map of the Tetons appeared with a shotgun-blast speckle of red dots, the locations of the nutcracker she had trapped yesterday in Togwotee Pass. It used to take several arduous days, even weeks, just to get one data point on the location of a radio-tagged bird. Now she was looking at 35 data points that had streamed in over just the past 24 hours. Data from one of these satellite-tagged nutcrackers depict the bird leaving its breeding territory in the Bridger–Teton National Forest to the east in midsummer and traveling more than 20 miles up into the Tetons mountain range, which has the healthiest whitebark pine stands in the region. Since then the bird has made excursions even farther into Idaho and north into Yellowstone National Park. Click on the map to see a larger image. Map data: Google, DigitalGlobe. In the months since, the satellite tags have gushed with data. Schaming now has four times more quality data on a breeding season than she’s ever had before. In the process, she has recorded the fastest flying speed ever observed for a Clark’s Nutcracker—nearly 35 miles per hour (the previous estimate in the scientific literature was 28 mph)—and she’s documented that they reach that speed for sustained long flights. Most importantly, Schaming has documented nutcrackers regularly venturing to places more than 20 miles from their breeding territory in winter and spring. It turns out nutcrackers may have much larger home ranges than previously thought. “That means they may need a large protected forested area for conservation,” Schaming says.